Old Bay... there is no other taste in the world like it. I am not even sure that I can fully describe it's taste with adjectives, but I am sure going to give it a try. It's savory, spicy, and salty. It simultaneous tastes of the ocean and reminds you of crabs and shrimp even when not served on either one of those food items. It's complex--so layered that you hardly know how many herbs and spices you are tasting, and which taste like themselves and which have fused with others to make a new taste. Old Bay is unique in all the right ways. Native to the Eastern Shore, it comes in an iconic yellow and blue tin, but you can't find it everywhere. (So, if you are on the other side of the country, or in another country entirely, don't be surprised if you don't know of it's glory.) It is mainly used to season shrimp and crabs, as I have mentioned (and without no crab feast would be complete), but those uses are certainly not the end of the story for Old Bay seasoning. The better question is, what DON'T I use it on? I don't use it in my pancakes. This is mostly because I don't make pancakes. I do, however use it in my signature bloody mary. 'Round these parts, an Old Bay rimmed bloody mary is something you find at local restaurants (and sometimes, when I'm feel really fancy, on my own bloodies.) It also makes a killer topping for my deviled-eggs. If you have never tried Old Bay on deviled eggs, well, then you simply haven't lived. It's like crack powder to the deviled egg enthusiast. It is also one of those spices that will give your seafood based soup a kick in the pants you didn't even know you couldn't live without. Seafood chowders are practically begging to be seasoned with it. A lesser known use outside of the seafood realm is also on chicken and pork. It does well as a bit of seasoning on these meats, especially on a night where you are feeling lazy and didn't want to marinate ahead of time. 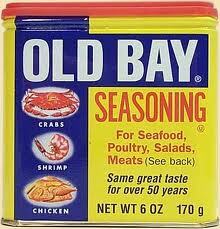 Old Bay is one seasoning that is just a staple in my life. I love it, and you can generally find it in the forefront of my spice cabinet. If you haven't tried it, you should make an effort to get your hands on some and sprinkle it on the nearest deviled egg. But I also know that many of you have also tried lots and lots of Old Bay, like me.... so it begs the question: what do YOU use it for? Please leave us your favorite uses for this awesome spice combo in the comments section below! A spice combination I have got to find, never seen before.